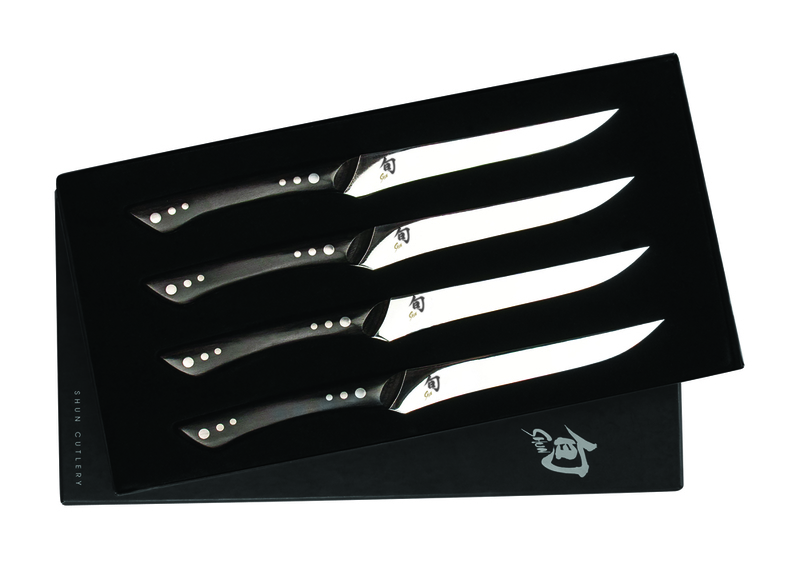 The Shun Shima Steak Knife Set is named after Tokyo's famous Shima Steakhouse, where diners from all over the world enjoy some of the world's finest beef. 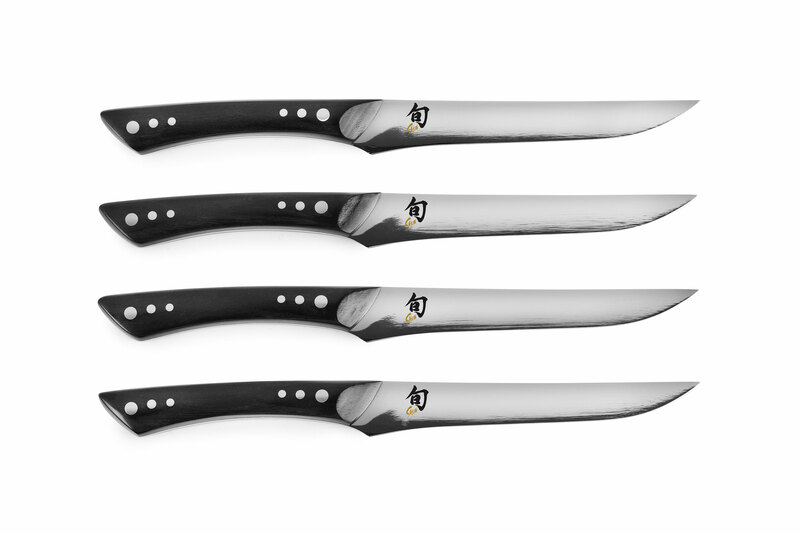 Inspired by Shima, these steak knives can make even the world's best steak taste better. Much of the delicious flavor in steak is contained in its juices, which are held inside by the fibers of the meat. Cutting with Shima's razor-sharp 16° edge means that far fewer meat fibers are cut with each slice. More of the juices and more of the flavors remain in the steak, where they belong. Shun Shima's long 5-inch blade with a slight recurve is designed for easy, one-pass slicing. Place Shima's blade flat against any surface and you'll see that the blade only touches the surface near the tip and at the heel. The rest of the blade is curved slightly inward. This shape is designed to ensure a smooth slice, whether pushing the blade forward or pulling it back. If the blade were flat, it would simply crush the steak, forcing you to "saw" through the meat. With the recurve, you start the slice at the front of the blade and push forward or pull back through the entire length of the blade. The edge contacts the meat at a slight angle and has a smaller point of initial contact, making it much easier to slice the food, without the resistance and "crushing" experienced with a blade that doesn't have the recurve. The recurved blade is also useful when cutting on a plate that has a lip. The shape enables the user to continue their slice all the way to the edge of the plate. Shun Shima's full-tang construction makes it an exceptionally well-balanced knife. The handle is slim, contoured to fit the hand, and tapers as it nears the blade. This enables a slight pinch grip for comfortable control. 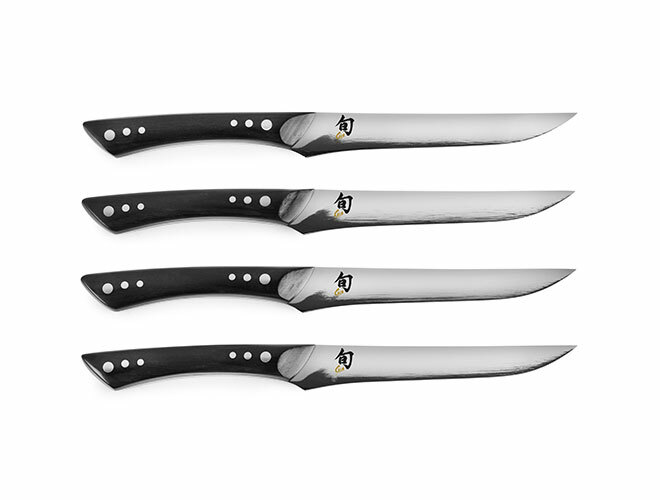 The slim, flat handle provides lateral stability, ensuring that the knife won't rotate or twist in your hand. The combination of the slim handle and gentle contouring provides easy, nearly effortless control while dining. The pakkawood handle scales, made of genuine hardwood and impregnated with resin, are beautiful, water resistant, and won't harbor bacteria. As a finishing touch, Shima handles are decorated with inlaid steel rondels. Made in Japan, lifetime warranty. 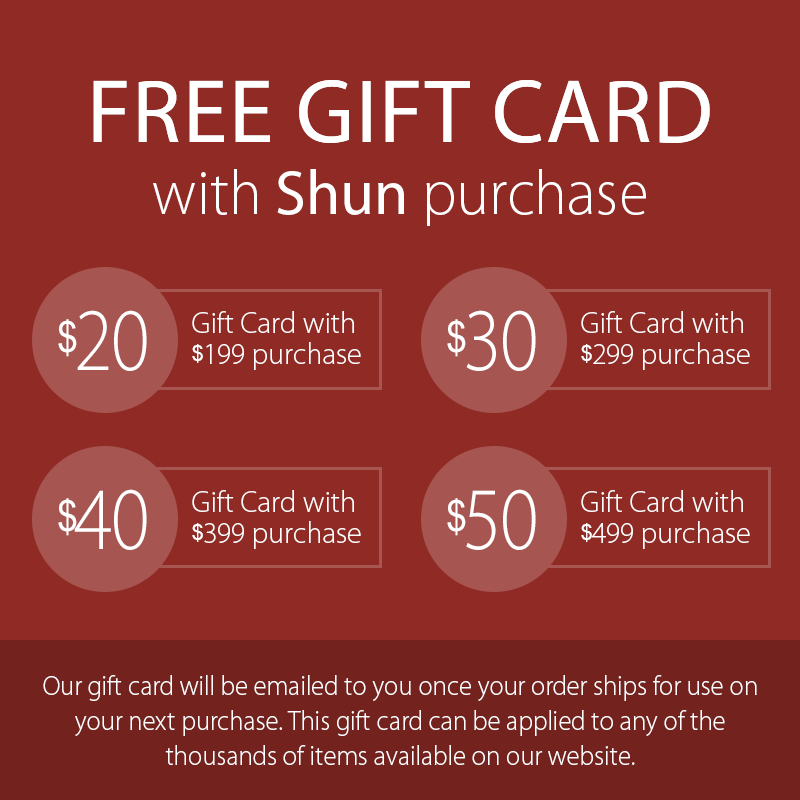 https://www.cutleryandmore.com/shun/shima-steak-knife-set-p131007 31007 Shun 4 Piece Shima Steak Knife Set https://cdn.cutleryandmore.com/products/large/31007.jpg 199.9500 USD InStock /Cutlery/Steak Knives The Shun Shima Steak Knife Set is named after Tokyo's famous Shima Steakhouse, where diners from all over the world enjoy some of the world's finest beef. 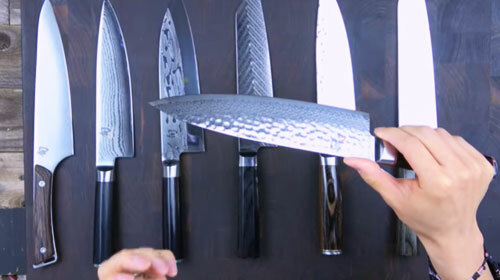 Inspired by Shima, these steak knives can make even the world's best steak taste better. Much of the delicious flavor in steak is contained in its juices, which are held inside by the fibers of the meat. Cutting with Shima's razor-sharp 16° edge means that far fewer meat fibers are cut with each slice. More of the juices and more of the flavors remain in the steak, where they belong.